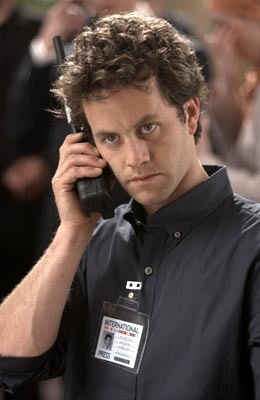 Just as a banana is an atheist's greatest fear, Kirk Cameron is the Tribulation's greatest fear. Here we see Cameron stare the Tribulation into submission. As we all know, the rapture occurred yesterday, May 21, 2011. After all, what else could explain the absolute silence of Harold Camping in the absence of earthquakes at 6pm in every timezone? Perhaps they were spiritual earthquakes. Who knows. But since you, like me, are left behind™, perhaps we should consider what to do now. If you see Kirk Cameron or Brad Johnson, keep in mind that it’s all in the script. What should we expect now? After all, now that the rapture has occurred, there’s going to be massive amounts of judgment hurled our way until it all goes *BOOM* on October 21, 2011, or thereabouts. June 1 – The One World Government will be established. To show how evil such a government is, Quebec will break away from Canada prior to the establishment of this government and then become the lead nation of the One World Government; there’s nothing more evil than French-Canadians. June 1 – July 1 – There will be relative peace during this time. Wars will cease, armies will give up their weapons, and Philadelphia will lose all their sports teams in order to secure a greater peace. October 8 – The final Battle of Armageddon is waged when God leads the forces of good (University of Oklahoma Sooners) against the forces of evil (University of Texas Longhorns). This will fulfill a double prophecy based on a minority Septuagint manuscript of Psalm 75:10, which reads, “And I shall saw off the horns of the wicked, but the schooner of the righteous shall be lifted up.” It will also fulfill the prophecy of Armageddon. What you need to be aware of is that there are actually more events that will occur; these are simply the biggest signs to look for. Chumbawamba will release a single, Glenn Beck and Keith Olberman will co-host their own show titled, “I’m Sorry, We Were Wrong,” Congress will pass a law (nothing specific, just that a law will actually pass), and George Lucas will opt not to ruin the “Star Wars” movie series anymore than he already has. Gary Busey will actually begin to make a lot of sense. We ought to be prepared for these things to happen, as it is all on the horizon. While there is nothing wrong in studying our ultimate end or in hoping for the resurrection – in fact, we are called to do this as the resurrection gives purpose to all that we do – we must never forget that we still live in the here-and-now. For every debate we have over whether or not Jesus will come before the Tribulation or after the Tribulation (or if there is a Tribulation), how many children go hungry, how many men cheat on their wives, and how many souls are lost forever? While some debates are worth having, how or when the end will happen just isn’t one of them. Posted on May 22, 2011 May 22, 2011 by Joel	This entry was posted in Off Topic, Uncategorized and tagged Christianity, End Times, Harold Camping, judgment, Kirk Cameron, Left Behind, Left Behind™, May 21, May 21 Rapture, Rapture, Ray Comfort, Religion, Satire, Tribulation. Bookmark the permalink. It truly breaks my heart that so many people actually believed him; I’ve heard that some of his followers actually quit their jobs and sold their belongings.